This weekend we had a small group picnic at the park. we had tons of food. Tons. 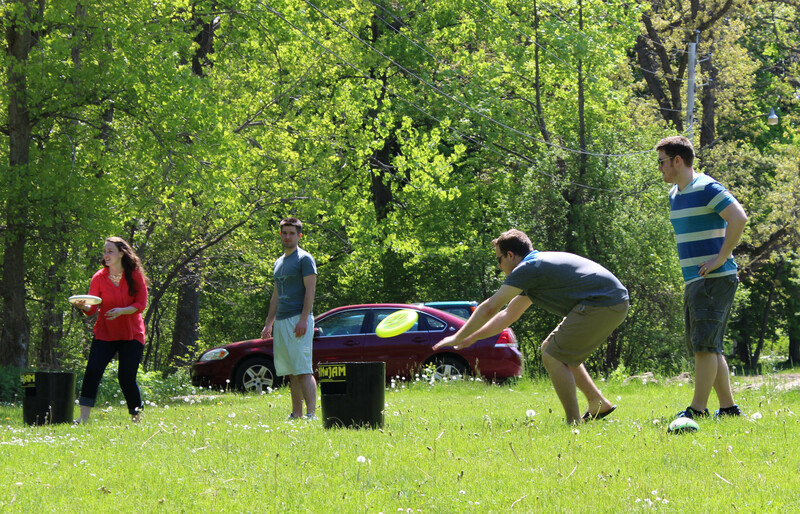 We grilled, ate, soaked up the sun, played kan jam, played with the puppies and ate some more. Amazing. This is Jack. He’s the cutest. I made Italian Cream Cupcakes. Oh. My. Goodness. Seriously. They were SO good. I even messed up the recipe and they were still delicious. I will definitely be making them again. Seriously. Try them. Preheat the oven to 350 degrees. Spray muffin pans (regular or mini) with nonstick baking spray OR line with paper cupcake liners. In the bowl of an electric mixer fitted with the whisk attachment, beat the egg whites they’re stiff. Transfer to another bowl and set aside; clean the mixing bowl and return to the mixer. Combine the butter, vegetable oil, and sugar in the mixing bowl and mix until light and fluffy. Add the egg yolks and vanilla, the beat until smooth. Add 1 cup of coconut and beat to combine. Sift together the flour, baking soda, and baking powder in a bowl, then alternate adding the flour mixture with the buttermilk, mixing for a few seconds after each addition. Add the egg whites and use a rubber spatula to fold them into the batter. Add batter to the muffin cups, the bake for 13-14 minutes, or until golden brown on top. Remove from the oven and allow to cool completely. To make the frosting, whip together the butter and cream cheese until smooth, then sift the powdered sugar and mix it in until combine. Add the vanilla and mix. Add 1 cup of coconut and the pecans, reserving a small amount of pecans for garnish. Mix until totally combined.